Gefitrust Tablets distributors, dealers & suppliers in Mumbai, India. 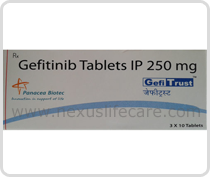 Uses:- Gefitrust Tablets is used to treat some types of non-small cell lung cancer. Gefitrust Tablets is used only in patients who are already taking it and being helped by it. Gefitinib Medicine is also being studied for use against other cancers.